Truer words. When Eric starts his new school he wants nothing more than to get along. He’s a decent kid, a little sheltered, perhaps (he doesn’t have a cell phone and his mother won’t let him use Instant Messenger). I’ve been the new kid and I know what it’s like to start a new school, so I felt for Eric as he surveyed the cafeteria that first day, wondering where to sit. In a month, he assured himself, everything would be fine. He’d make new friends, sit with them, eat, joke, laugh. But right now, today, the first day of school, it all kind of sucked. But on another level, none of it really mattered. Eric could smell his meatball sub and he felt hungry. He wanted to eat. When Griffin stops at his table, chagrined that Eric is alone and invites Eric to eat with him and his friends, Eric accepts. In some ways, it’s a bit like making a date with the devil and we all know what they say about the devil you know, right. It doesn’t take long for Eric, who is a smart kid, to figure out that Griffin just isn’t the kind of friend he wants to have, even if it means that he’s going to suffer for it. 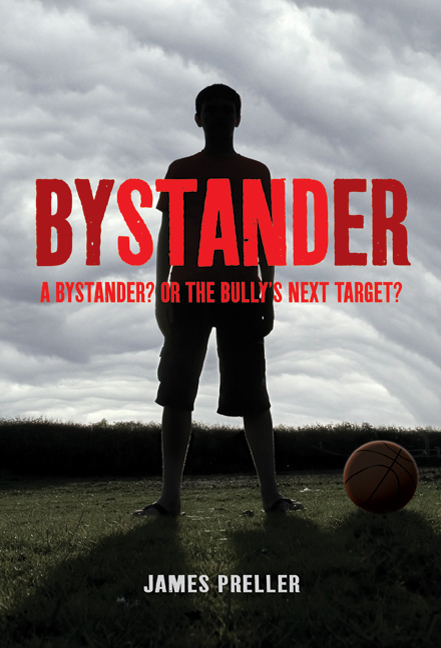 Bystander is a straightforward novel about making choices. Bullying is a hot topic these days and something we talk about even at the high school level. Published in 2009, Bystander doesn’t really address the problem of cyber bullying; Griffin is a garden-variety thug (if you can actually be a thug at 13.) The thing about Griff, though, is that he’s sort of sympathetic; Preller doesn’t paint him with a simple black stroke. Despite the fact that the book is intended for a younger audience, I think I have some grade nine students who would enjoy this story. They are not so far removed from middle school that they won’t remember characters just like Griff and his ilk. This entry was posted in Book Chat and tagged 2015, Book Review, middle school, teen by Christie. Bookmark the permalink.